Finely chop garlic. Peel and dice onion and carrots. Heat some olive oil in a large frying pan and sauté onions, carrots, and garlic. Add ground beef to brown, breaking it up with a cooking spoon. Season with salt and pepper. Now, add crushed tomatoes and season again with salt and pepper. Simmer covered over medium heat for approx. 15 - 20 min. Stir in dried oregano. Meanwhile, preheat oven to 200°C/390°F. For the béchamel sauce, melt butter in a small sauce pan. Add flour and sauté, stirring constantly to form a roux. Add cold milk in portions and reduce over medium heat, stirring occasionally, for approx. 5 – 8 min. Season with nutmeg and salt and pepper. Cover bottom of baking dish with a layer of meat sauce. 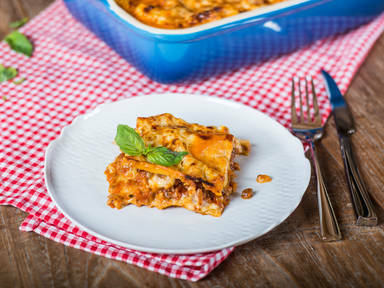 Top with lasagna sheets and béchamel sauce. Repeat procedure until ingredients are used up. Finish off with béchamel sauce. Top with freshly grated Parmesan and bake in preheated oven at 200°C/390°F for approx. 30 – 40 min. on the middle rack until golden. Serve hot in baking dish.